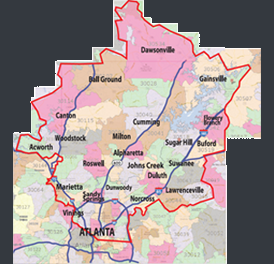 Atlanta Pet Groomers - 1 of Our 6 Pet Grooming Vans is Close To You. 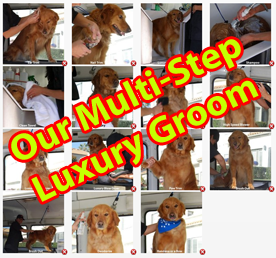 MobileGroomingAtlanta provides a Multi Step mobile grooming Spa Treatment for your DOGS & CATS! WE COME TO YOU! Our experienced pet groomers come to you to groom your pet at your doorstep. Our Dog Groomer and Cat Groomer specialization means you found the right solution for your pet today. Our Luxurious Groom includes: Eye Cleaning – Nail Clipping – Brushing out Knots & Debris, Shampoo, 1st Rinse, Ear Cleaning, Brushing out Loose Hair, 2nd Rinse, Towel dry body & face, Pet friendly High Velocity Water Blower that takes the majority of the water from your pet’s coat, Blow Dry, Brush Out, Deodorize, ending up with a ribbon or bow & if allowed, a special treat for your pet! We also offer other services: De-Shedding treatment, Aloe Skin treatment, Pad treatment, Shave-Downs, Puppy Cuts, Clips, Flea &Tick Shampoos, Frontline, Teeth brushing, Therapeutic Shampoos, De-Skunking and all our products are Bio-Degradable, Eco Friendly & Natural. OUR 1 on 1 SERVICE WITH NO CAGES HAS PROVEN TO BE LESS STRESSFUL FOR YOUR PET AND MORE CONVENIENT FOR YOU! 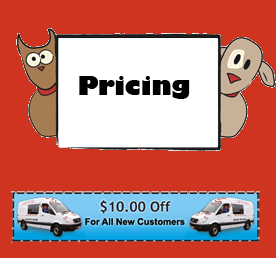 If You Are New To MobileGroomingAtlanta Please Print Out This Page And Show It To Your Groomer For A $10.00 Savings On Your Pet(s)’s First Appointment. If you see your city here then we serve your area! Look Up Your Zip Code To See If We Serve Your Area!